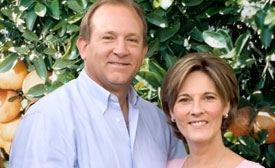 Dennis Holbrook grew up in a citrus and row crop farming family. After returning from Texas A&I University, and again joining the family business, he purchased the family citrus operation from his father in 1977. He soon became disillusioned with and concerned about conventional farming. Thus, South Tex Organics, L.C. was established in 1984. Dennis decided farming organically was nature's way, the best way to grow the most nutritious and best tasting citrus. He felt a commitment to provide the consuming public with an option to purchase citrus grown naturally without the use of toxic chemicals. Converting from decades of chemical assisted farming to organic growing systems was a daunting task. It took several years of growing cover crops and applying compost before seeing the evidence of renewed life in the soil. Another challenge was gaining an understanding of the intricacies in natural growing methods and the benefits produced by obtaining harmony in the ecosystem. Dennis cooperated in a study with John Goolsby a Texas A&M graduate student in developing habitat areas around the fields to attract and harbor beneficial insects, a practice which has been adopted in many growing regions throughout the world, and one he continues today. It is our firm belief that sensible and natural cultural practices provide a healthy foundation to produce a healthy crop. All products grown by South Tex Organics, are qualified by the standards of the National Organic Program of the United States Department of Agriculture (USDA) and certified organic by the Texas Department of Agriculture. While Dennis was building wholesale customers, Lynda, his wife, turned her interest to developing the mail order portion of the business after receiving numerous requests for home delivery and gift orders. Through home and gift orders the company continues to provide a means by which everyone can connect to organic goodness. Since Dennis began farming organically he has become the largest organic citrus and vegetable grower in Texas, with over 500 certified acres in his operation. His product line currently consists of the famous Texas Rio Star grapefruit, several varieties of oranges, Meyer lemons, red and yellow onions. Dennis has taken an active part in the growth of the organic industry. He is a member of the Organic Trade Association (OTA). He is a founding member of the Texas Organic Growers Association (TOGA) serving as President and Chairman of the Board. He was appointed by Agriculture Commissioner Jim Hightower in 1989 to serve on the first Texas Department of Agriculture's (TDA) Organic Certification Review & Standards Advisory Committee. In 2008 Agriculture Commissioner Todd Staples appointed Dennis to the newly formed Texas Organic Agriculture Industry Advisory Board. Mutual, Texas Citrus Pest & Disease Corporation and the Citrus Producers Board. South Tex Organics, L.C. has come a long way since sending its first shipment of organic citrus to Whole Foods in Austin, Texas in the back of a horse trailer. We now distribute truckloads throughout the nation and export to Canada.